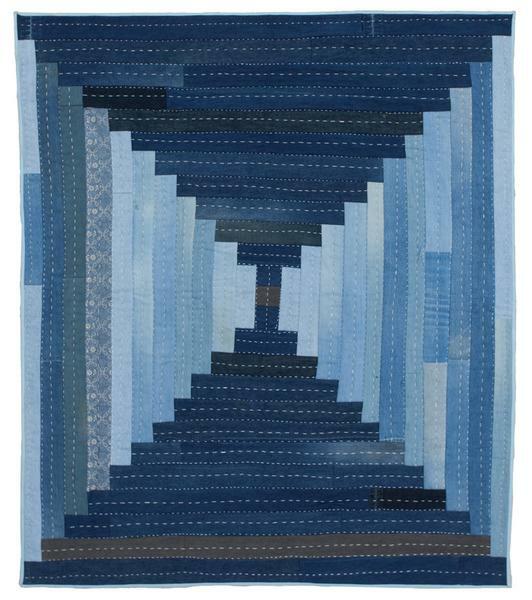 The Denim Courthouse steps quilt is my latest one-of-a-kind piece. This quilt was pieced with thrifted denim jeans and hand quilted with sashiko thread. Each pair of jeans is uniquely shaded and worn, adding variation and interest to the architectural pattern. Hand quilting adds texture and variation to the surface. The quilting stitches of every quilter are unique, adding personality and signature to each piece. The back of this quilt is pieced with a variety of scrap fabric and scrap projects. Many of the small pieces come from the inside of denim pockets that were used to piece the quilt top. I love adding a special pieced back to each quilt, it is important to me that the back of each piece to be in harmony with the front.